Nuclear fusion power creates very fast-moving electrically charged particles. This post is about the two major methods for converting the kinetic energy of these particles into useful electrical energy. One of them, heat engines, is a well-proven technology with well-understood operating guidelines and some limitations. The other, direct conversion, is an very new technology that has not yet had an opportunity to be employed in an industrial setting. Heat engines are well understood. Almost everyone in the modern world has probably heard of the steam engine, which is an example of a heat engine. Heat engines are a way to convert intense heat into mechanical power. For electric power production, the steam-driven mechanical power is then transformed into electricity. This is very well understood because we have literally built millions of heat engines. About eighty percent of the world’s electricity comes from steam turbines. Converting fusion power to electricity through this path requires several energy conversion steps. The kinetic energy of the fusion products is converted into heat when they strike and penetrate the walls of the reactor. The shielding is designed to stop the particles, spreading out their kinetic energy so that it becomes the motion of many particles (heat). This process is nearly 100% efficient. That is, almost all of the energy from the fusions will show up as heat in the reactor shielding. A small amount of it will go into nuclear reactions caused by the particles hammering the shielding (causing neutron capture reactions for instance). The heat in the shielding is converted into mechanical power through the use of a heat engine. These engines are governed by the limitations imposed by the Carnot efficiency. High-quality modern turbines can convert with approximately 33-48% efficiency depending on temperatures, quality, and working fluid. That is, only 33-48% of the heat energy will be converted into mechanical power. The mechanical power is converted into electric power through various generator technologies. These systems are also nearly 100% efficient. All together, we can see that the biggest losses are made during the thermal to mechanical step. Continual efforts are being made to improve heat engines, but there are some fundamental limits they must obey as per the second law of thermodynamics. Direct conversion is a method by which we can convert fast-moving charged particles directly into electrical current. This is very different from the concept of using the fast-moving particles to cause heat that we then use in heat engines such as steam turbines. Images for this section drawn from Direct Energy Conversion in Fusion Reactors, by Ralph W. Moir, Lawrence Livermore Laboratories, Livermore, CA. In order to understand why direct conversion works, you need to understand electric potentials. I will attempt to provide an illustrative explanation here in case the reader is not familiar with the physics of this concept. First of all, what is potential energy? The classic example is a boulder sitting on top of a hill. The boulder isn’t moving, so it has no kinetic energy (which is the energy of motion). However, since it is on top of a hill, a tiny nudge can send it careening down the hill. This means that is has potential energy. In this case it has gravitational potential energy. As the boulder rolls down the hill, its potential energy is transformed into kinetic energy. Eventually the boulder will come to a rest some distance from the hill since it will lose its kinetic energy as it rolls (to friction and other energy loss forces). The key concept here is that potential energy can be transformed into kinetic energy. The opposite is also possible. Imagine that you are driving a car on a smooth road towards a hill. Just as you are nearing the bottom of the hill, you turn off the engine and coast up the hill. You lose speed rapidly as you climb. If you were lucky, you will have exactly enough kinetic energy to reach the top of the hill and stop at the top (balancing precariously like the boulder was originally in our first example). Now, electric potentials are similar, but we do have to deal with some additional complexities. For instance, there are both hills (positive potentials, created by positive charges) and valleys (negative potentials, created by negative charges). If we look at the simplistic example of a positively charged particle approaching a positive potential, we can use the hill analogy. So if the positive particle is going fast enough, it can climb all the way to the top of the positive potential ‘hill’. The positive potential resists the attempts by the positive particle to climb, since as we all know, positive charges repel each other. Things get a bit more complicated when we are dealing with a potential and a charge that are of different signs. In these interactions, we can always regard the potential as a conceptual ‘valley’ as far as what the charge sees. That is, a negative charge will be attracted to a positive potential, causing it to go towards the point of greatest positive potential. If we are analyzing the motion of a negatively charged particle, we can consider all of the hills and valleys to be reversed, since the force on a negative particle is equal to, but in the opposite direction of, the force on a positive particle. So, now that we have the concepts of electric potentials under our belts, how do we convert the kinetic energy of a charged particle into an electric potential? It is important to note that the positively charged particles (the ions) are thousands of times as heavy as the negatively charged electrons, but carry practically equivalent charge. An ion might be carrying +2 charge (lacking two electrons around it), while an electron by itself carries -1 charge. This means that the electron has a much larger charge to mass ratio than ions. This means that electrons accelerate much more quickly than ions when affected electric fields (and potentials). This asymmetry allows us to effectively ‘sort’ these particles onto different electrodes. First we will look at a relatively simple single-stage direct conversion system. There is a detailed image below that shows what we are talking about. In the image below, particles are propagating from the left to the right. The big circle shows a zoomed-in image of the area delineated by the smaller circled area. The kinetic energy of the positive particles is transformed into potential energy as they climb the potential hill that is created by the Ion Collector (which is at a very high potential of 100 kilo-volts). Ions strike the Ion Collector and ‘steal’ electrons from it. This has the effect of removing electrons from the target plate, thus increasing its positive potential. Remember that electric potential is created by collections of charge. In this case we have added positive charge to an already positively charged plate, increasing its potential. On the other hand, since electrons are relatively light, we can reflect them away with a grid of electrodes at a relatively small negative potential. In the image below these are labelled as the “Electron Reflector Grid”, which is at a negative potential of -10 kilovolts. The electrons are thus reflected towards the Electron Collector Grid, which is a different collection surface than the positively charged ions. The negative potential will attract the positive ions, but since it is just a grid (not a barrier), and they are moving with great momentum, they pretty much ignore the electron reflector grid as they fly right past and strike the Ion Collectors. We have thus effectively sorted the incoming particles onto separate collectors according to their charge. 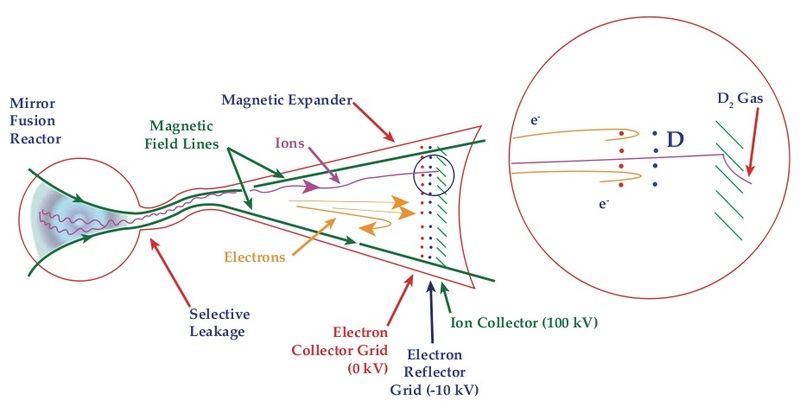 We have widened the potential gap between the Ion Collector and the Electron Collector Grid because we have positive current flowing onto the Ion Collector and negative current flowing onto the Electron Collector Grid. This current flow becomes the electric power that we are producing. This example system has an efficiency limit of about 50% because it is only able to provide one potential for the ions to strike. However, we can expand the concept by creating a potential ‘stairway’. The more energetic a particle is, the further it can go to the right in the image below. We use a series of positive potential ‘steps’ to slow down the positively charged particles. One can imagine this as a series of steps up the side of a big hill. The more kinetic energy that the positive ion has, the further up the hill it can make it before it runs out of speed/momentum. Again, in the image above, the potential is lowest on the left side and highest on the right side. In this image, there are 22 ion collectors at progressively higher potentials as you progress to the right. Electrons, as before are reflected by low potential grids (the little dotted half circles) and collected seperately from the ions. The ions end up being sucked in towards the sides slightly by the electron grids and then strike the positive potential plates at each stage. This 22 stage tester was created in a lab and tested. The test yielded a result wherein 86.5% of the kinetic energy was converted into electricity. This is a much higher efficiency than we can reach using heat engines such as steam engines, which currently max out before 50% efficiency. In the future it may be possible to push the thermal engine efficiency up a few percent, but they are not expected even in coming decades to get anywhere near the efficiencies boasted by the direct conversion method. That said, we must keep in mind that while this system has been tested on a small scale in a lab, and relies on solid physical principles, we cannot guarantee that it will be able to deliver these efficiencies for a full-sized 1-3 GW fusion power plant. There are certainly some engineering difficulties to be analyzed and overcome before we can claim that this is a fully proven technology like the steam engine is. The science behind fusion power. Helpful tools for understanding nuclear fusion. Fusion fuel cycles: What they are and how they work. The basic realities of fusion reactor design. If you were to use the direct conversion method would the heat still be available to run steam turbines? If so you could use the direct conversion as well as steam power. It is my understanding that if we used direct conversion there wouldn’t be sufficient leftover heat that we would bother running steam turbines off of it. Of course I might be wrong, and a large fusion plant using this system might produce enough heat to make additional thermal turbines worthwhile. this was awesome dude, I am from Bilston and even I understood it, thanks a lot buddy….. The purpose of constructing nuclear fusion reactors is to achieve “ignition” of plasma, in order to rise Q rate for cheaper energy. Using direct conversion method for electricity production would mess all the process up as it would cool down the plasma, so ignition would fail, as the logic of using fusion. Am I wrong? Direct conversion is really just another way to capture the energy that the reactor is spewing out. So, rather than just letting high-energy particles slam into a heat shield and converting that heat into energy via a heat engine, we instead directly capture the charged particles on different plates. The fusion process itself isn’t directly affected by this since it’s just a difference in how you absorb/capture the energy that the reactor is producing, not how the reactor itself is running at the core.